Traveling in Illinois and Missouri last fall I met up with Jim Schlager who showed me M J Right Time and his progeny. This is a big, low to mid 6 frame bull with a lot of volume and muscle moving on a good, big foot. His heifers were to die for and maybe some of the best cattle I have seen in a while. 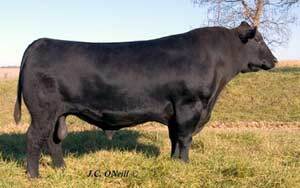 His bulls showed a lot of power and balance and are really easy for Jim to sell. I don’t know a breeder that wouldn’t want females like he can produce. 159 calves ratioed 99 for birth weight, 100 for yearling weight, and 103 for yearling weight. His progeny will make you proud.